When the Influence Network announced their first 1-day conference would be in Charlotte, almost local to me, I jumped at the opportunity. For four years I've watched #InfluenceConf be shared wishing we could've afforded the opportunity for me to join this community at the conference to celebrate and grow in their God-given influence. It was an answered prayer! For friends not familiar with the Influence Network, it's a membership community exploring God-given influence right where we are. You can follow along for free with their social media as a point of encouragement, but I highly recommend becoming a member (more on this in a future post!). Today I'm sharing my personal takeaway from the overall conference message along with quotes and scripture references. I'm getting vulnerable with my reflections in this post for a few reasons. First, the message is one we all need. Second, I always wanted in on more details of the conference. So, this is for the sister who wanted to be there but couldn't! 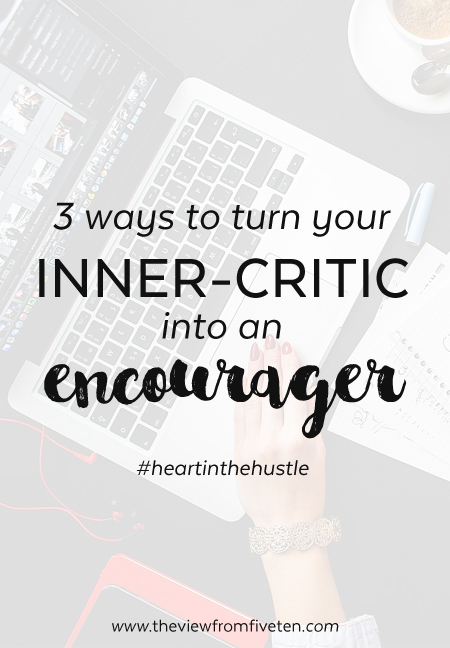 Last, I want to open the conversation on these topics for our #heartinthehustle community. Speaker topics and scripture focus varied throughout the 1-day conference, but sweetly woven into the fabric of the day was the message of God's rich grace and power in these areas: our vulnerability, our influence and our testimonies. I'm excited to continue to the conversation post-conference! Now onto conference lessons! Vulnerability is the new black. If you’re looking for 2016's buzz word this is it: vulnerability. I’ve never delighted and feared a word so much! For months I’ve been peeling back what it means to get vulnerable in our stories and our daily routines through Brene Brown’s Living Brave Semester, and the Influence ladies brought a good word and affirmed what I've uncovered on the topic. Vulnerability is not weakness, it's courage. It's free-falling into the arms of our Savior trusting that as we show up only armed in His truth goodness will flow and Kingdom seeds will be planted. We delete the lie of the enemy with the truth of the Gospel as we show up and allow ourselves to be seen as daughters of the King: chosen, redeemed, remembered, and able. Your story matters, and so does hers. Our influence is void of impact without our testimony. It’s going to take vulnerability to show up with our messy hearts and let our testimony influence others. The pretty stories and styled squares of social media are only surface level. If we’re going to know the joy of the Lord deep in our bones we need to step out of the shadow of doubt into the light of love with all of our mess. I think it’s that simple. Jesus finished the work and that changes everything. When we look to Jesus’ life we see him fully embrace his purpose, and little by little it influenced others and ultimately pointed back to the Father. Isn’t that what want? Time and time again Jesus emptied himself for others in humbleness with great empathy towards their stories. Jesus knew our stories would be just as influential for the Kingdom as his. Let's take off the fleshly armor of worry and comparison to speak eternal truths over one another. My story matters for the Kingdom, and so does yours. Let’s link arms, enter into the mess together and build for the Kingdom. Your have influence right where you are. We can shift the focus off of potential future influence and onto our surroundings right where we stand. 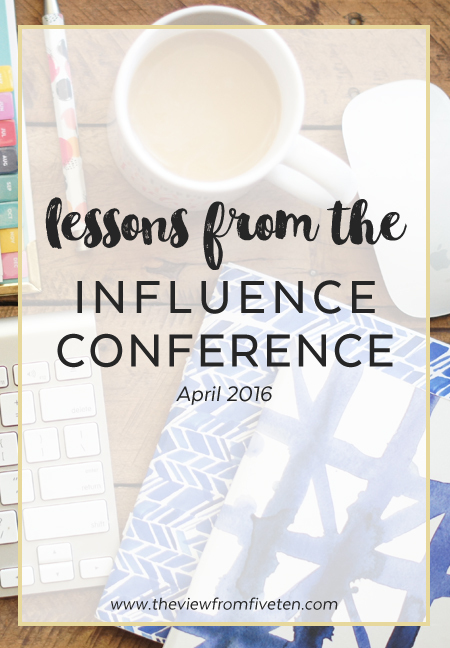 Influence happens here in our everyday hustle. Instead of harping on interruptions we must simply open our eyes to God's opportunities. Our hearts become enabled to see God and to share our testimony of His grace as we allow others to interrupt our agendas. Let's inspect our hearts, what opportunities have we brushed off as interruptions? Gretchen sweetly reminded us there’s no measuring stick in the Kingdom. This message was layered throughout the conference. Whatever your season it is good and it is for His glory that we lean into our God-given influence. Tending to littles with piles of laundry, car-pool lines and time-outs. Launching a business, blog or book. Showing up to your 9-5. Serving at your local church. Getting your mail. Going to class. Swinging by the supermarket. We have influence right where we are in Jesus name. It has taken me over a week to process the message from the 1-day Influence Conference, and I'm sure to reference this post frequently in the coming weeks. The 1-day event was special time of fellowship, and the overflow of community can be felt so sweetly. If you attended the conference I’d love for you to chime in below, or if you missed out let’s keep the conference conversation going here! For more information on the Influence Network, visit their website and Instagram. Tests bring out the critic in each of us. I would categorize myself as an awful test taker. Words were always my strength, choosing the right bubble not so much. My inner-critic came out most during Art History exams in college. For these exams we were required to know the name of the artwork, the artist, and date of creation for hundreds of pieces per test. Hundreds - this is not an exaggeration! In preparation I'd hole up in the library for an 8 hour study binge leading up to the 3 p.m. exams. Building up to and following those exams my inner-critic ran rampant with my emotions. So you can imagine how my inner-critic made himself known when I failed a test recently. In my Living Brave class with Brene Brown, she challenged us to take a self-compassion test from Kristin Neff. And I failed. I failed the self-compassion test. Pretty quickly the warm wash of worry overcame me and that inner-critic started stomping on my joy. The truth of it is, years after overcoming my war with depression, I still battle self-compassion on a daily basis. More than not, my worst critic is myself. I think it's time we open the conversation on self-compassion within the Christian community. Certainly we can’t expect to serve well in any capacity if we’re not first tending to ourselves. Hear me out: it's okay for us to need to work on us. A heart deficient of self-compassion breeds shame, anxiety and overwhelm. Let's make intentional effort to increase self-compassion to turn our inner-critic into an encourager of Wholehearted joy. So what exactly is self-compassion? It’s speaking to ourselves with empathy rather than anger, and choosing grace in place of judgment. Self-compassion is not a permission slip to continue in sin or complacency, but an opportunity to live the life of grace and growth God calls us to. Through self-compassion we sideline overwhelm, calm anxiety, and deepen healthy relationships with ourselves and others. We may battle with self-compassion on a daily basis, but there are simple action steps we can make to overcome the fight for simply being kind to ourself. According to Brene, wholehearted joy stems from engaging with the world from a place of worthiness. When we define our worth we begin the conversation of self-compassion. When we look to scripture it doesn't take long to learn our worth is found in Jesus. In Christ we are made new and can move boldly before the throne with confidence in our worth to God. Shift your perspective on self-talk. There’s a fine line between giving yourself constructive criticism, and down right holding yourself in contempt. The joy in your life is a direct result of the quality of your thoughts. Remember this, in Jesus, there is no condemnation (Romans 8:1). The Gospel is the permission slip of self-compassion we've been seeking! Of all the people who could point fingers and call out the ugliness of our sin, it should be God. Instead, He covers us with grace upon grace. Let’s take a lesson from Him on this one, shall we? Maybe you’re like me and have made great strides in self-compassion, but recently realized there’s still a ways to go before self-compassion dwells deep in your bones. Resilience in the daily routine will be built upon putting self-compassion into practice. It won't be perfect, but it will be progress. God enters into our mess and celebrates along side of us with each baby step of self-compassion. Every small step matters; If you fall, dust yourself off, practice self-compassion and keep going. Allow self-compassion to be a starting point of wholehearted joy in your story. The world has enough critics, let’s stop being our own worst critic. I was too late. The bulldozers had already come. The walls which once held my life's memories had been shoved aside; now just an immense amount of rubble. It had been months since the fire, and still an oversized pile of ashes was all that was left of everything I once knew. Rivers of tears flowed as I wrestled with the belief there was no where up from here. This valley was too low, the battles before us seemed too hard to take on. But God. I was paralyzed by self-doubt, fear and worry. In that moment, I didn’t trust God was present. I couldn’t see Him through the soot-smudged lens of life, but deep below He was there, an unshakeable platform I’d uncover over the next five years. I may have been shaken, but He had not moved from my foundation. Life will have deep valleys. No person has a way out of struggle, but God stands ready as our strong foundation in every season. Five years in, I can tell you tales of God showing up in the dark, but when you're in the pit it's not always so easy to see the light. Wholehearted joy cannot be built on a shaky foundation, and God gives us opportunity in the hard seasons to rebuild on our Cornerstone, Jesus. Our hearts become equipped to rise with more joy when we take time to intentionally re-strengthen our foundation before framing up a new chapter. So, how can we strengthen our foundation in Jesus? Open the Bible. Our foundation is strengthened when we welcome God to dwell in us. It’s not just a Sunday thing. His word is an every day, every moment, every breathe kind of necessity. He calls us to abide in Him so that he may also abide in us. As much as I appreciate instant gratification, abiding is a discipline that takes intention. Open your Bible, see His character through His word, make a space for God to dwell in you. Partner with the Holy Spirit. It’s important to pray that goes without saying, right? God drives this home through scripture. But for us to strengthen our our foundation to see long-term support, I'd challenge us to take prayer one step further. Pray the Holy Spirit would awaken in your heart. God is comprised of the Trinity, and sometimes I feel like the Spirit gets the short stick. Despite his vital role, we bench him too often. Do not neglect the Holy Spirit in you! He’s our advocate and counselor. Scripture tells us the Spirit takes from Jesus and testifies directly to us. Who doesn’t want Jesus speaking straight to them through partnership with the Holy Spirit?! Amen? Be vulnerable in community. When hard times hit, we like to retreat. We like to grab a pint of ice cream, binge watch Netflix and close out the world. Briefly, this may feel like sweet relief. But real, eternal, relief is found at the Cross. When we’ve opened our Bible and partnered with the Holy Spirit, the Cross is going to compel us to put down the ice cream, turn off the Netflix and take our mess out to our people and get vulnerable. Let’s be clear right now: vulnerability is not weakness, it is courage. Just as Jesus enters into our mess, we need a community of like-minded Christians to enter into our mess with us. You don’t have to share with the world, but seek trusted counsel and fellowship. God will grow you in your faith and foundation through fellowship. When life looks like an oversized pile of ashes, we do not have to be afraid. Jesus is our cornerstone (Acts 4:11-12), and through Him we have the opportunity for abundant joy. Before you rebuild, strengthen your foundation, and prepare to see God make beauty from ashes. The culmination of Lent and Easter always leaves me wanting more. We exit a time of reflection and repentance with the utmost praise and worship for the completed work on the Cross. Now we're left to sort out the implications of this question: If Jesus is the resurrected Messiah we waited for, now what? For many years my life was void of any real, lasting joy. I aimed to please people more than God. I pursued circumstantial feelings over faith. I sought my will over His will. These feelings ruled my life: shame, guilt, doubt, fear, overwhelm. I didn't know who I was in God or what it looked like to live joyfully as myself: redeemed, restored, revived. I didn't know how to build a wholehearted life out of the ashes of brokenness. If Jesus is real then we've been covered by grace and sent in His authority. If we've tasted His grace then the Spirit dwells in us. If Jesus is real then what God is doing in us internally will inevitably be displayed in us externally. If Jesus is real then our life becomes one long obedient response to the Cross. Who says we have to be stuck in our brokenness? The solution is life on God's terms! No more darkness of doubt and worry of self-gain, but a surrendered life free of fear full of joy. Years of research in the mission field of life has uncovered a great truth: Wholeheartedness is the work of surrender. It's holding out our hearts, hopes and agendas as we yield to God's plans. No more sitting on the sidelines, it's time to build for the Kingdom. Wholehearted Finishings is the start of a community conversation on wholeheartedness. This space is created out of a need of accountability. I need you. You need someone. We all need Jesus. 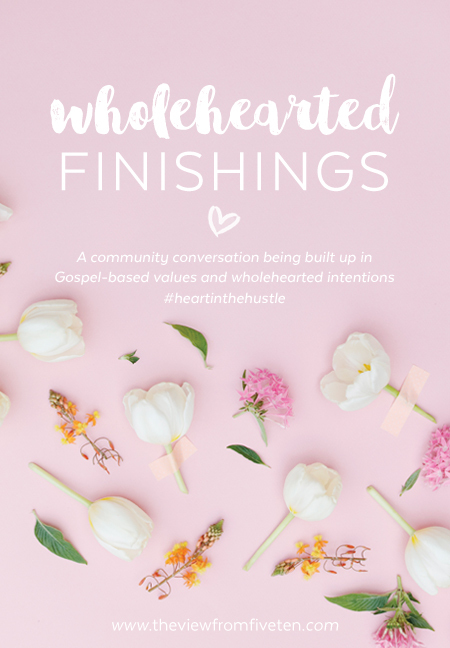 Wholehearted finishing takes intention and thrives in fellowship. As you create your monthly goals, I encourage you to go a step further and reflect on your Gospel-based values & intentions for the month. We leverage our wholehearted hustle by defining our unique Gospel-based values. Values move us past to-do lists and goal setting straight to the heart of our hustle. It starts with faith as our foundation and Jesus as the cornerstone. Framing goes up on our foundation then it's time to install the Finishings. Wholehearted Finishings strengthen characteristics of a Christ-like heart so we can ensure our best yes for the Kingdom every time. The first week of each month, I'll share my monthly Wholehearted Finishings along with resources for you to define and grow in your Gospel-based values. It takes brave obedience to build wholehearted joy, but it's worth it - God's worth it. If we were sitting down for coffee today, I'd tell you this wholehearted conversation is me walking by faith. I'd tell you that this monthly linkup is just the start of a community conversation on Gospel-based values. I'd tell you this is me being vulnerable on mission because I believe our hearts are desperate to see God glorified in the daily routine. I'd tell you I'm afraid but filled with joy. I'd tell you I'd love nothing more than to link arms with you to build wholehearted joy for the glory of the Lord. Let's link arms. I hope you'll join me as we move forward in pursuing wholeheartedness. 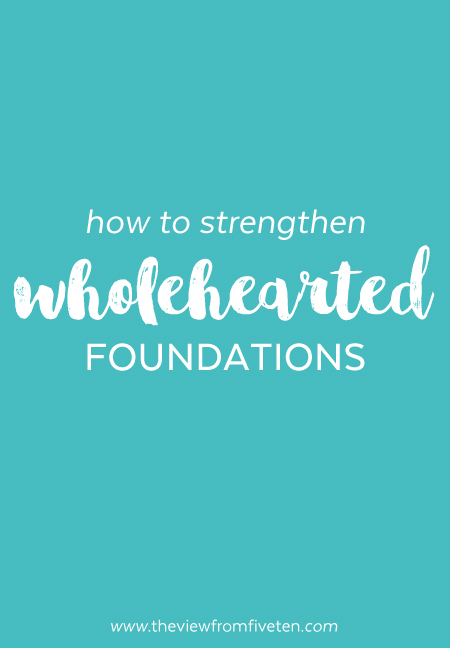 I recommend four simple steps to make your Wholehearted Finishings lists. Each item on my Wholehearted Finishings list is broken down into four parts: mission field, value, intention, truth. Keep it simple, make it meaningful. Step 1: Prepare your heart and ask the Holy Spirit to convict you in your Gospel-based values and intentions for the month ahead. Add your info to the form below to receive our Wholehearted Finishings guidebook and worksheet straight to your inbox. Step 3: This is the installation phase where we partner with the Holy Spirit to mind the gap between our professed values and our practiced values. Move through your list of mission fields to assess the Gospel-based values and intentions you can lean into this month. Fill in your values, intentions and scripture verse below your mission fields. Step 4: Position your heart to yield wholeheartedly to your Gospel-based intentions. This isn't about coming back at the end of the month to cross things off a list. God's not going to ask what we've accomplished, He's going to ask how we loved His people, how we shined for the Kingdom. Let people see Jesus in you through the daily routine. The margin isn't going to be meaningful until we go into the day wholeheartedly. Finishing Tip: always write in a mission field TBD. Write it in. Don't overlook the need for margin. God is going to move this month and you'll need space to be bold in obedience. Plan to pursue Him into the unknown this month!